Many times, through no fault of their own, some people lose all of their teeth. 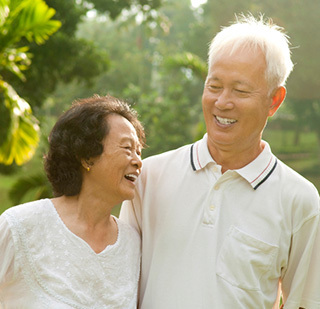 In the past, dentures were the only solution, and they are still a wonderful solution for people in the Montgomeryville, North Penn or Lansdale area who want to be able to smile, eat and speak naturally. At Black and Bass Cosmetic and Family Dentistry in Lansdale, we have several restorative dentistry denture options that we think will give you the freedom to choose which procedure is best for you. Our office near Montgomeryville and North Penn will partner with you so you can love your smile again. TRADITIONAL DENTURES | Traditional dentures are an apparatus that can be used for your top teeth, your bottom teeth or both. They are made to look like natural teeth and are custom made to fit you comfortably. The denture appliance is adhered to your gums with adhesive. Our Lansdale office serving the Montgomeryville area offer you high-end traditional denture appliances that look and feel like natural teeth. IMPLANT SUPPORTED DENTURES | Implant supported dentures are truly a marvel to anyone who needs dentures. The denture is attached to dental implants. Dental implants are small metal rods that are placed into the jawbone. After the rod has fused with the jawbone, usually 3-6 months, a dental crown is placed on the implant. The crown and the implant together give you a “new” tooth root and tooth. Implant supported dentures are remarkably sturdy because the dentures are secured to the dental implants. Implant supported dentures are the most natural looking denture option for our patients from the North Penn community as they will stay secure. Implant supported dentures offer the most comfortable fit and look remarkably natural. Both denture options have value and our cosmetic dentist serving Montgomeryville and North Penn will help you decide which is right for you. With traditional dentures, the original time to get a full set of teeth is rather quick and this is the most economical choice. Implant supported dentures require the 3-6 month healing time, but are more secure and sturdy. Whichever you choose, traditional denture treatment or implant supported dentures, we will do all we can to give you a healthy, happy smile again. Call our Lansdale dentists today!